Our popular AlphaCurcumin Plus has now been reformulated with Phytosomal Curcumin Complex, which is superior to even liposomal curcumin. 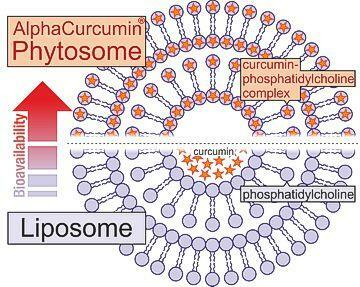 This new formulation ensures that AlphaCurcumin remains the top curcumin complex supplement. The big problem with the beneficial compounds in curcumin is that they have very poor oral absorption. As a consequence, impractically large amounts are needed to derive the full benefits of curcumin. A solution to this problem has been found by finely mixing the curcumin with lipids, as curcumin is fat-soluble rather than water soluble, and this vastly increases absorption by basically having the lipids carry the curcumin into the body. AlphaCurcumin now contains 250mg of this phytosomal curcumin, as well as other ingredients that can help in the healing process such as Bromelin and Quercetin. For further information on our reformulated AlphaCurcumin, please click here.